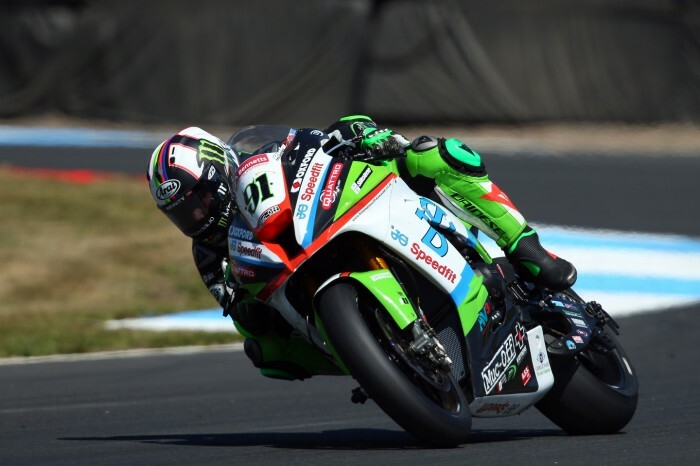 Championship leader Leon Haslam extended his advantage and broke up Jake Dixon’s Knockhill win streak with victory in the second Bennetts British Superbike win this afternoon. JG Speedfit Kawasaki’s leading rider held off the race one winner to stretch his points gap to 74 points after five rounds. But Haslam had to fight from sixth on the grid through to the lead and capitalised on a near-high-side by Dixon to take victory. The grid had shrunk before the race even got underway as Jason O’Halloran, Luke Hedger and Fraser Rogers were missing from the start, but it was Dixon who shot ahead of pole-sitter Danny Buchan from the start as Bradley Ray, Glenn Irwin and Haslam tucked in behind. Ray was soon through into second as Buchan fell back into the clutches of Haslam, where the points leader made his move at the Hairpin to take third heading onto lap five. After a few minutes of graft, Haslam had caught up to Ray and Dixon, and was beginning to have a look at the Buildbase Suzuki rider, but the top ten remained largely unchanged other than Andrew Irwin slipping by Luke Mossey to slot into tenth. Half way through, the top five had closed back up as Dixon, Ray, Haslam, Buchan and Be Wiser Ducati’s Glenn Irwin sat 1.7s clear of McAMS Yamaha’s Josh Brookes. Moments later, Haslam dove up the inside of Ray to take over second at Clark’s, before Buchan followed Haslam through at Taylor’s Hairpin and knocked Ray back to fourth. Just outside the top five, Aussie Brookes pulled off the track with a mechanical, putting paid to any improvements on his eighth place finish from race one. Five laps from the flag, Haslam had a go at the Hairpin, but ran wide before trying again at Duffus Dip, only for Dixon to come storming back past. But Dixon’s lead wasn’t to last after a massive moment exiting Clark’s, which Haslam immediately pounced on and snatched the lead. Lee Hardy Racing’s main man soon came under fire from FS-3 Racing Kawasaki’s Buchan, but the Essex rider couldn’t quite have a go as Dixon put his head down and regained lost ground to Haslam. But his double wasn’t to be and Haslam finally broke up Dixon’s quest for a fourth Scottish win on the trot, taking victory by 0.215s while Buchan settled for third a further 1.676s back. Glenn Irwin took fifth from Tyco BMW’s pair of Michael Laverty and Christian Iddon, with Richard Cooper just over half a second further back in seventh. Andrew Irwin scored his best finish in eighth, beating Anvil Hire TAG Racing Yamaha’s James Ellison by nearly six seconds as Smith’s Racing man Peter Hickman rounded out the top ten.